Cap Arcona was built for the German based Hamburg South Amerika Line, or better known as the Hamburg Sud Line. This company was founded November 4th 1871 to create a service for the growing emigration trade from Germany - South America. Hamburg Sud were one of the largest companies operating on the South American run until the Treaty of Versailles stripped them of all their ships after World War One. Their fleet was distributed between Germany’s conquerors to replace ships they lost during the war. This forced Hamburg Sud to order small liners and charter ships from other companies to rebuild their fleet. By the mid 1920s, they had recovered enough to order their new flagship Cap Arcona. This ship set out on her maiden voyage from Hamburg - La Plata/Argentina November 19th 1927. By the time World War Two broke out in September 1939, the Hamburg Sud Line had built up a fleet of 52 ships. Cap Arcona was laid up at Gdynia at that time to avoid being captured by the Allies. Between late 1944 and May 1945, German ships transported over two million East German refugees to the west in an attempt to save them from being slaughtered by the advancing Russian armies. Cap Arcona made three such runs across the Baltic Sea in 1945 rescuing 26,000 refugees. 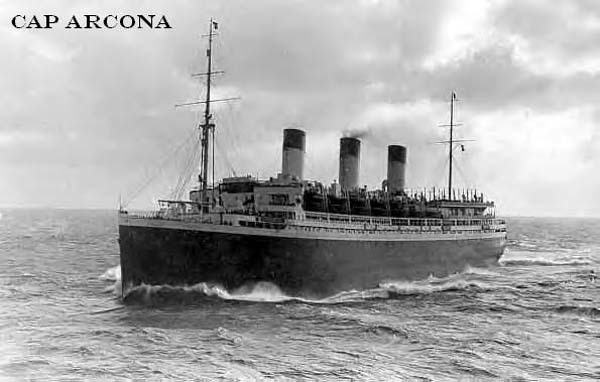 The Nazis operated Cap Arcona as a floating prison in the dying days of the war with 5,000 prisoners from the Neuengamme concentration camp being transferred to the ship. As Allied forces closed in on the last remaining German held positions, Cap Arcona was attacked by British Typhoon bombers May 3rd 1945 and sunk with the loss of almost all on board. British forces marched into the City of Neustadt the following day. Had the troops arrived one day earlier, they would have taken control of the ship and freed the prisoners.